My current show is at the Cotton Company in Wake Forest. There are several watercolors and oil paintings on the display there, including scenes of Wake Forest. The show runs through February 2, 2013. 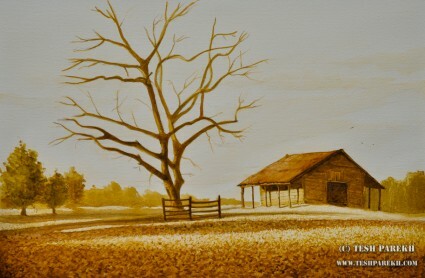 “Evening at Joyner Park” is one of my watercolor paintings on display at the Cotton Company in Wake Forest (NC). I am excited to have my work in Lucky Pie Gallery in Cary (NC)! This is a new gallery in Cary where I currently have my two watercolor paintings for sell. I look forward to displaying more work with this gallery. 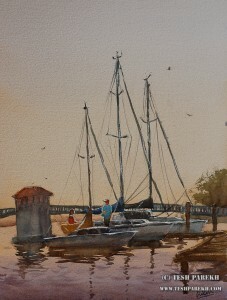 “Docked- New Bern” is one of my watercolors available through Lucky Pie Gallery in Cary (NC). I hope to enter my work into more contest this year. I had entered couple of contest in December. Just received an update on one of the contest: my painting “Departed” has been juried into Tipping Paint Gallery‘s Still Life painting contest “Flowers and $#!+”. This is a new fine art gallery located in Raleigh Downtown. The opening reception will be on Feb 1 (6-9:30 PM). 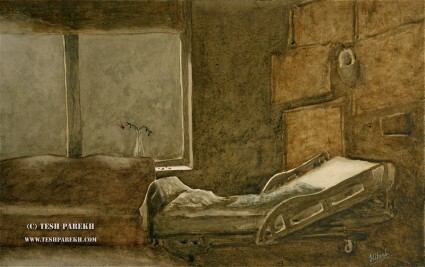 “Departed” has been juried into Tipping Paint Gallery’s Still Life contest.